What is it with mobile phone and Laptop accessories available for women?! Why do companies seem to think that branding something in pink is the answer to capturing the female market? OK… so, some people do like pink, I for one have a few pink accessories, but that’s mainly down to the fact that there isn’t that much out there. But what if you’re a business woman who doesn’t want brightly coloured, ‘in your face’ accessories? Well… Your search is now over! Knomo have a beautiful range of laptop bags and iPhone covers as well as an iPhone wallet wristlet, which in practice, is extremely useful – Although not ideal if your someone who loses their phone a lot! It’s nice to see a company think about what women *really* want from their accessories. The leather iPhone cover fits snugly and looks very smart and professional. I had lots of compliments from friends when sporing this around town. Although, my wish would be for them to produce some nice Blackberry covers too. 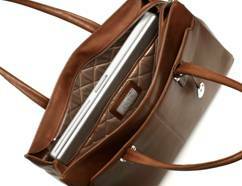 Knomo’s Laptop bags, like their iPhone accessories, are quality stock. I had the pleasure of trying out their ‘Luxury Tan’ coloured Rosa 15 ” laptop handbag , which looks extremely sophisticated I have to say. Now don’t get me wrong, these accessories are not cheap to say the least – the Rosa laptop handbag retails at £245. I can’t help but think, however, that if you can afford it, it’s worth the investment as it’s made extremely well and doesn’t look like something that’s going to fall apart in a few months. The phrase ‘buy cheap, buy twice’ comes to mind. They offer a range of bags in all different shapes and sizes to suit the various laptop sizes offered these days. To compliment the bags, they offer laptop slip cases. Next Next post: Waze is in need of some girlpower!! !